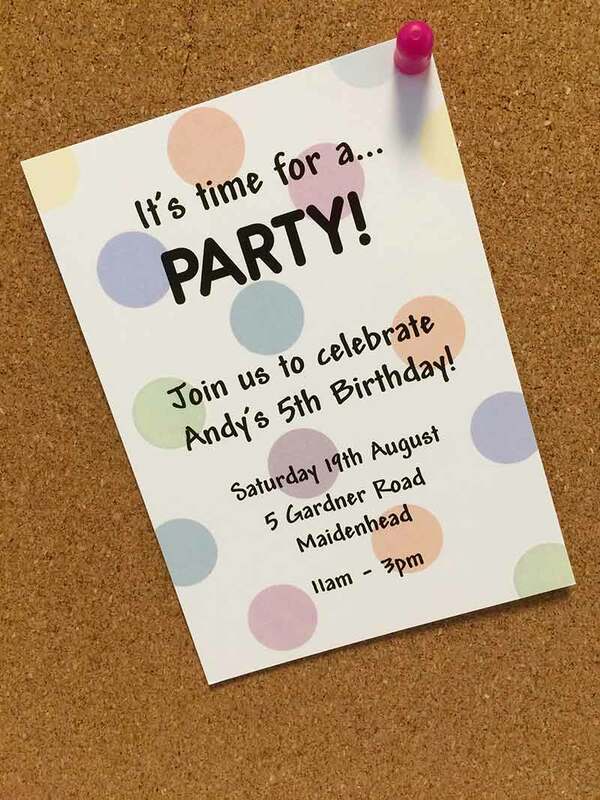 At Avery WePrint, we understand that it can be REALLY easy to go to your nearest supermarket and buy a generic invite that isn't really personalised to the party you're planning or to your taste. Plus it can be difficult to add important information or personalise it to your child's taste or theme. So, I worked on creating a fun birthday invite for my cousin, Andy. Andy loves colour, but his mum wanted a invite that still look understated enough to impress the posh mums at school. Want to see the finished invite? We're pretty proud of it! I used our single sided A6 postcard to create the invitation. It's the perfect size to fit all of the required information - the location, the date of the party, the duration and Andy's age! How can I create a personalised invitation for my child's birthday party? We have many templates available for our customers, but I chose to begin with a blank product. She used the shapes tool to create the polka dot design but chose to keep it colourful to keep Andy happy! By reducing the transparency of the polka dots, the design looked understated enough to impress the posh mums at school. Then came the text! Andy's mum provided a list of important information that she wanted to including Andy's age, the location, the date of the party and most importantly, when to arrive! I chose to use the Andy font for the main text (which was ideal for my cousin! ), but wanted to make sure that people understood that it was a party! I used Report Rg Bold because it looks like an appropriate and fun font. Our postcards have a gloss finish on the front and a matt finish on the back, it means that Andy can write a little message for his friends on the back of the invite too! Got any design ideas for a birthday invite for kids? Comment below and let us know! For more design ideas for celebrations, check out our Celebrations Get Inspired page.